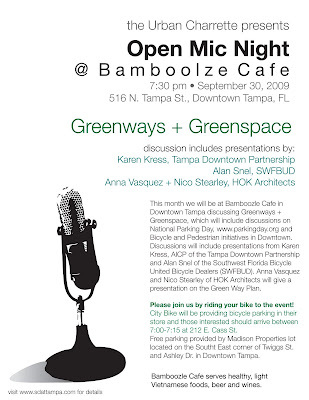 See you at Bamboozle Cafe in downtown Tampa for Open Mic Night to talk bicycling. Karen Kress of the Tampa Downtown Partnership and Anna Vasquez and Nico Stearley from HOK architects will join the discussion. Starts at 7PM. How moronic is the city of Tampa about bicycling? Here's a city that has transportation engineers that don't understand bike lanes or design roads that are safe for bicyclists. But there has been a law on the books that required bicycles to have a bell. Well, the city council is getting around to repealing this bicycle bell law, the St. Pete Times says. My Hobart College friend Brian Vanneste, who I last saw in Minneapolis when I biked across the country in 1983, sent me a terrific story about cyclists thanking city officials in Saskatoon for building bike lanes and establishing "a $2-million fund for bicycling infrastructure for future projects such as extending and creating more bike paths." How many times have we heard Tampa city officials tell us they can't afford bicycle infrastructure? In the city of St. Petersburg, I heard they have budgeted $1 million for each of the next five seasons to continue its comprehensive bicycle infrastructure program. In Tampa, it's time for bicyclists to demand our fair share of the infrastructure pie. Well, I couldn't help myself today. After returning from St. Pete where I filmed a segment on the Bicycle Bash by the Bay for FOX News, I dove back into cleaning up the proliferating bicycle photo files that are jumbled in my computer. I sorted more files, gave titles to files with the keepers and tonight I offer you kind Bicycle Stories readers some of the visual highlights. Man's ability to use a bicycle for utilitarian purposes -- fishing in this fella's case -- knows no boundaries. Guess this guy? He owns a recumbent bicycle company called Bacchetta in St. Pete and set the recumbent record for RAAM last year. I saw him on the Oinellas Trail. Bacchetta, I hope you can exhibit at the Bicycle bash by the Bay on Oct. 11. Free burritos at Chipotle lured several dozen bicyclists on one Seminole Heights Bicycle Club ride. Have you noticed that Tampa bicyclists like to use milk crates as baskets on their bikes? I'm always fascinated that people try to bring the comforts of home on the bike -- like this multi-media center. USF students early at Flatwoods. Reverse angle shot of St. Pete Mayor Rick Baker and pals opening the Pinellas Trail extension into downtown St. Pete. Baker loves bicyclists, but someone should have informed the mayor that the proper way to fit a helmet is for it to cover one's forehead. This fella turns the sidewalk along Tampa Street north of Columbus into his own outdoor wrench area. The bicyclists of Fun-Lan drive-in/flea market deserve their own post. The Miracle Tire. It got nailed but it didn't get flattened. Another one of my favorite shots. The dude is proud of his homemade wheels. One of my all-timers -- my bicycle pal Steve on the tall bike wrapping up a Seminole Heights Bicycle Club ride. Reminds me of women's roller derby on two wheels instead of two. I'm guessing Gramps is taking little junior out for a spin. Gramps also looks like he's a veteran cigarette smoker, too. The Team New Tampa folks like to ride fast. It's hard to get in a word with them, they bike so fast. Dogs and bicycles and the owners who love both. Finally, playing sweeper for today's batch of photos, Jose. Chris Allen, SWFBUD's newest member, saw a cool photo op this morning. Looks like this motorcyclist is also a cyclist. Meet Chris at the 2009 Bicycle Bash by the Bay, Presented by Cure on Wheels on Oct. 11 in North Straub Park, downtown St. Petersburg. It's a scary chore, but it's time to houseclean the photo files that have multiplied in my computer during the past year. So many files, so many pictures to review, so many to delete and some to rename. In doing so, I went through my first 100 unnamed photo files and offer you 10 images that I want to share. So, I finishing a 46-mile ride from Clearwater along Hillsborough Avenue just east of the Dale Mabry Highway when I see a long yellow bicycle heading west on Hillsborough on the opposite side of the road. I'm trying to count the cyclists on this one bike -- I see a man at the front, then two little kids on seats, then a mom = and finally, a fifth seat, occupied by the third daughter. That's right folks -- a quint bicycle! This bicycle built for five was being driven by Bill and Amarins -- and their three daughters, Cheyenne, 7; Jasmine, 4; Robin, 3. Oh, their trip? How about pedaling 7,000 miles from southeast Kentucky to Alaska. They've been on the road for two months now and their motto is simple: "Ordinary people on extraordinary journey of giving and receiving." Dad Bill says they're blue-collar workers who are nomadic by heart, want to live simply and hit the road on a shoe-string budget to teach their daughters that there's good all around the U.S.
As a long-distance cyclist who has crossed the U.S. twice on solo bike journeys, I can see the wonder in their eyes and the power of their spirits when I chatted with them around 12 noon on Hillsborough. Channel 10 caught up with the Harrisons. The Harrisons will be in Tarpon Springs for four days and will have a broken spoke fixed. Bill hands me a deck of business cards to hand out at the Bicycle Bash by the Bay festival on Oct. 11 in St. Pete. Robin is tuckered out. Good thing there's a head support for her. Check out those pedal arms! They're being tested on this 7,000-mile journey. The company that makes these pedals and pedal arms is from Fort Pierce, across the state. Another bicycle tragedy -- a bicyclist killed in Brooksville. According to the St. Pete Times story, he was struck while bicycling against traffic. "According to the report, James Jr. was riding south along the outer white line of the northbound lane near Tampa Street at about 3:45 p.m."
Please folks, always bike WITH the flow of traffic. Seminole Heights Bicycle Club members don the reflective vests, lights and hunger for ice cream in our inaugural Bo's Ice Cream Bike Ride tonight. With the rolling Bicycle Bash billboard showing off its new sign for this year's bike festival, I took the Bash-board for its maiden ride across the Gandy Bridge this morning. In years past, I took the Friendship Trailbridge from Tampa to St. Pete. With Pinellas and Hillsborough counties closing the Trailbridge last November due to structural problems, I took the Bash-boatd along the shoulder for the 3-mile across the Gandy Bridge. My bicycle pal Ellen Pierson escorted me along on her bike and played photographer as we biked from Tampa to St. Pete. Then I met Bridget in downtown St. Pete to promote the Bicycle Bash festival on Oct. 11 and also visit the Holocaust Museum, the Museum of Fine Arts and the Museum of History in downtown. Matt, owner of Tour de Pizza in the Publix shopping center at 4th Street and 38th Avenue, has drawn a ton of publicity for his "Pizza Diet." Matt supports bicycling and the Bicycle Bash by the Bay and was happy to pose next to the rolling Bicycle Bash billboard today. Boston Bill may have lost his foot but he certainly didn't lose his spirit and his heat for bicycling. In fact, Bill's love for life and bicycling after losing his foot prompted Jeff Klinkenberg of the St. Pete Times to write a touchy story about how Bill helped a young kid going through teh same ordeal. Bill's story made People Magazine and Bill told me today that Disney called and he has to learn to play golf quickly because he was invited to a big fundraiser golf tourney. It was a hoot to meet Bill on First Avenue on tyhe Pinellas Trail near the St. Pete waterfront and SWFBUD looks forward to Boston Bill's Sunglasses being at the 2009 Bicycle Bash by the Bay on Oct. 11 in downtown St. Petersburg. It may have been 90 degrees plus this afternoon in downtown St. Petersburg. But the toasty weather didn't deter this Daniel Boone fan from wearing his raccoon headgear to the St. Pete folkfest. Just another day at the Pier in downtown St. Pete. On the way to St. Pete, Ellen made a good point about DOT forgetting something on Gandy Avenue -- a bike lane. Here's the message for DOT -- you dropped the ball and forgot to put a bike lane in the Gandy Ave. project. Cycling the Bicycle Bash Billboard to St. Petersburg this morning with bike comrade Ellen Pierson to promote the Oct. 11 Bicycle Bash at the downtown farmer's market and other locales in downtown St. Pete. Hillsborough County Commissioner Mark Sharpe went to bat for bicyclists recently when he worked with SWFBUD to keep Hillsborough County's parks open seven days a week and he has also worked behind the scenes to connect the Upper Tampa Bay Trail with the Suncoast Trail. Commissioner Sharpe believes cycling is the new golf, and that the way to attract high-tech and medical research businesses to Tampa Bay is to support quality-of-life issues and public amenities such as bicycling. That's why I attended Sharpe's fundraiser last night in Tampa and I urge you to back political leaders and elected officials who support bicycle infrastructure and improving conditions for bicyclists and work to remove politicians who do not have the best interests of bicyclists at heart. I will be representing SWFBUD next Wednesday at 7:30 PM at Bamboozle Cafe in downtown Tampaand discussing my 10-point plan to improving bicycling around the Tampa area next week at an open mic night event held by the Urban Charrette. The Urban Charrette is a group of eager and intelligent planners, architects, sustainability folks etc. who want to make Tampa a better-designed place to live. The open mic night will focus on greenways and green space. This afternoon the famed Bicycle Bash rolling billboard-trailer got a new sign just in time for this year's event on Oct. 11. Thank you Tampa Tribune for some nice previews of the 2009 Bicycle Bash by the Bay. The Trib ran this story by Mary Shedden and also this story this afternoon. Ranger Rick Says, "Thanks SWFBUD"